Lewis Carroll was a mathematician and author, best known for his best selling – Alice in Wonderland stories. 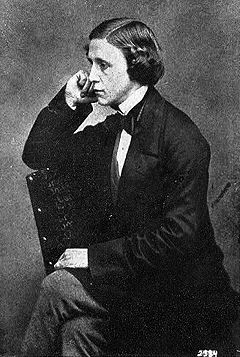 Lewis Carroll was born, Charles Lutwidge Dodgson, on 27 January 1832. His family came from the North of England and had strong connections with the Anglican church. His father was a strong conservative in the Anglican church. As a child, he showed prodigious intellectual capacities. He excelled at Maths and was a great reader. After an unhappy few years at Rugby school, he moved to Christ Church College where he studied Maths. With little work and great natural talent, he gained a first in Honour Maths and was later awarded a studentship. He spent the next 26 years teaching Maths at Christ Church. In many ways, teaching was not an ideal job for Carroll, who was afflicted with a stammer which made giving lectures difficult. Also, he found that many of his students were uninterested in his subject. Nevertheless, for those interested, Carroll would devise difficult mathematical puzzles and questions of logic. He could easily lose himself in complex mathematical problems. Throughout his life, he sought to suggest solutions for many issues from rules for postage to rules for tennis tournaments and betting rules. In 1856, Henry Liddell and his family moved to Christ Church for Henry to work as Dean. Carroll became close to the Liddell family and their children. He would often take the three sisters, Lorina, Edith and Alice on boating expeditions around the River Thames and Nuneham Courtney. It was on one of these expeditions, that he first gained inspiration for the ‘Alice in Wonderland’ Story. Carroll was quite shy at the prospect of publishing, however, he was encouraged by Alice Liddell. Also when he showed the manuscript to his friend and mentor George MacDonald, he received more encouragement to publish. The book was a great commercial success and earned Carroll a significant sum of money. 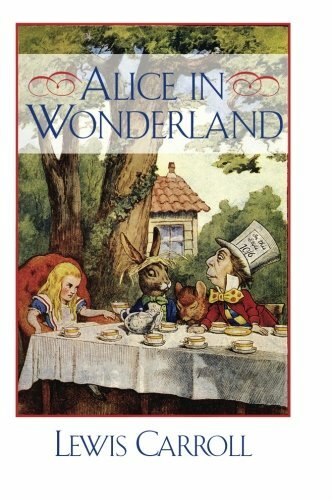 The Alice In Wonderland stories were pioneering in offering a nonsensical childhood fantasy tale – quite different to the more pious Victorian tales of morality. The story revolves around a seven-year-old Alice, who falls asleep in a meadow and plunges down a rabbit hole. There, Alice enters a fantasy world of bizarre and wonderful characters such as the Mat Hatter and the Cheshire Cat. Though seen as a children’s book at the time. It influenced many later literary figures such as W.H. Auden, Bertrand Russell and Virginia Woolf. Its humour can be seen in books such as Catch 22. In the middle of writing these fantasy stories, Carroll also wrote two mathematical works Condensation of Determinants (1866) and An Elementary Treatise on Determinants (1867); these established his reputation as a significant mathematician. It is ironic that the great logical mind of Carroll invented a world of Alice in Wonderland where logic failed to apply. His last major work was The Hunting of the Snark (1876) a nonsensical poem which many have tried to decipher. Despite writing under a pseudonym, Carroll was still taken aback by the publicity generated by his books. Apart from a short visit to Germany he remained at Christ Church throughout his life. 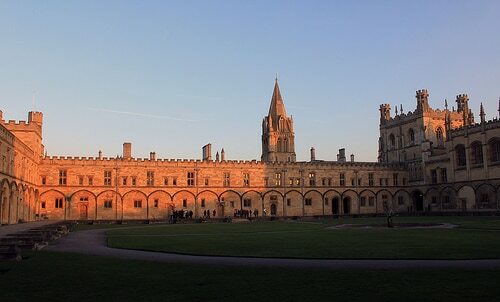 Lewis Carroll became interested in the new activity of photography and took many portraits of friends, developing a dark room in Tom Quad, Christ Church. These photographs included photos of naked children, usually girls. Opinions have differed, on the sexuality of Carroll, but it is worth noting taken similar photos were quite common in Victorian England. He remained a bachelor throughout his life. It was expected that as a Senior student at Christ Church, Carroll would become ordained as a priest in the Anglican church. However, Carroll requested to avoid being made a priest. Though this was against college rules of the time, it was allowed for Carroll. His relationship with the Anglican church remained uncertain. Towards the end of his life, he took an interest in new religious movements such as Theosophy. Though he remained a quiet reserve outwardly, he never the shared the same enthusiasm for the High church that his father and contemporaries at Christ Church did. Citation: Pettinger, Tejvan. “Biography of Lewis Carroll”, Oxford, UK www.biographyonline.net, Published 22nd Jan 2011. Last updated 22 Feb 2018. Writers and authors – Famous authors such as J.R.R. Tolkien, William Shakespeare, J.K. Rowling, Jane Austen, Leo Tolstoy, John Steinbeck and Ernest Hemingway. Famous mathematicians – A list of famous mathematicians, including Thales, Euclid, Newton, Turing and Nash.